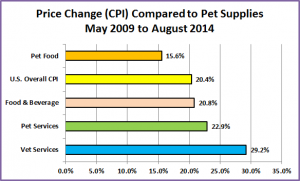 Pet Market Pricing Update – August CPI Drops! The latest CPI data for August is out. August is usually a fairly predictable and stable month. In over 70% of previous years…Vet & Non Vet Service prices usually take a little dip…and Food & Supplies go up. 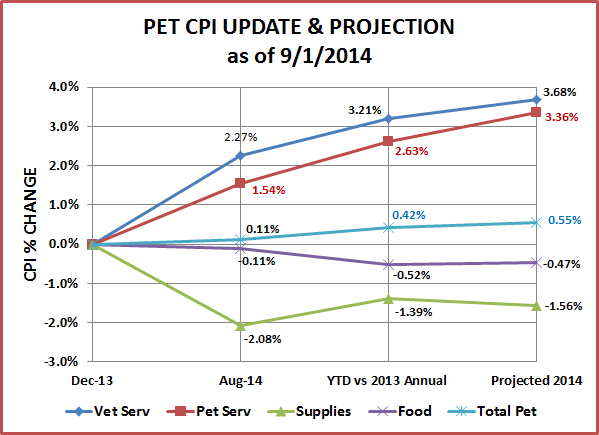 The overall Pet CPI has gone up in August 94% of the time. The Pet Supplies Segment usually goes up in August. Not only did it not go up. It dropped almost a full percentage point from July. 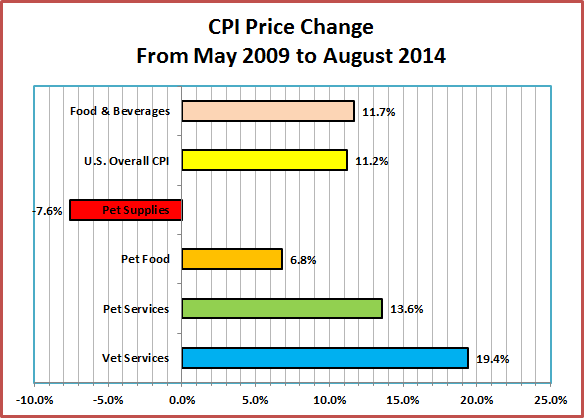 The overall Pet CPI dropped in August. This has only happened 1 time in history and that was 15 years ago. This drop was largely driven by the Pet Supplies segment. 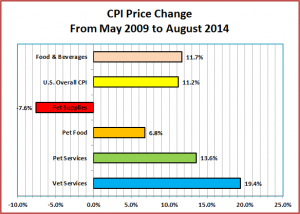 Vet Service CPI – down 0.1% over July – As expected. Pet Services – up 0.1% over July – Not normal; Usually drops in August. Pet Supplies – down -0.9% from July – Not Normal; Usually goes up in August. Pet Food – up -0.3% from July – As expected, but smaller increase than normal. Total Pet – down -0.1% from July – Not normal – Dip in August hasn’t occurred in 15 years. Service prices should continue steadily upward. The only break could be a possible dip in Veterinary prices in November. The peak month for pricing is invariably December. Food has hopefully started the regular pricing climb which goes from August through November. Then comes a big drop in December. With the unusually low prices for the first 8 months, it appears very likely that the 2014 CPI will be less than 2013. An annual drop in prices for Pet Food has occurred only 1 other time – in 2010. 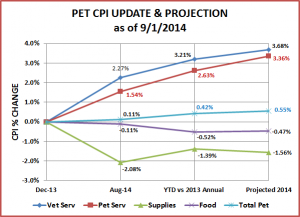 Pet Supplies prices continue to “plummet”. There is no other word for it. They are down 1.74% just since June. This is going into September which usually produces another drop and the price low point for the year. October and November generally bring CPI increases followed by the December Drop to close out the year. Driven by ever increasing Service prices, Total Pet has never had a drop in annual prices. 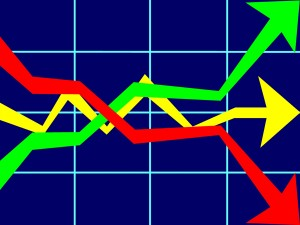 The smallest increase was 0.6% in 2010. This was driven by CPI decreases in both Food and Supplies. We have the same situation now and we are “on track” to meet or beat our record low. The Pet Supply Segment is the ongoing concern. We saw that an unexpected big drop in Supplies prices pushed the whole Pet Market into negative numbers in August for only the second time in history and the first time in 15 years. Somehow the 1% drops here and there and even the 7.6% drop over 5 years doesn’t seem like that much. Since Pet Supplies is going in the opposite direction from the other indicators, it’s hard to compare. Let’s use Pet Supplies as the “base” performance and compare these other categories to it to see what the overall differences are. Except for Pet Food, there is over a 20% difference in the pricing performance of Pet Supplies vs other economic indicators. The difference in the services is understandable as the price of basically all services has been growing faster than the National CPI. However, 20+% differences in pricing performance from food and beverages and the overall CPI are significant. Remember, all these categories were operating in the very same economic conditions. If you “do the math”, it shows that the gap has widened at an average rate of 4% or more, in every year since 2009. Will the deflation continue? In recent years, September has been the “bottom” month for pricing in the Supplies segment so it is possible, even likely that we will see another CPI drop in September. The big question is when will this segment “put on the brakes” and start a true change in direction? A deflating market grows increasingly difficult for manufacturers, distributors and retailers.